1 bedroom (double bed) Apartment, with living room where there is a big comfortable convertable sofa, separate kitchen and balcony. 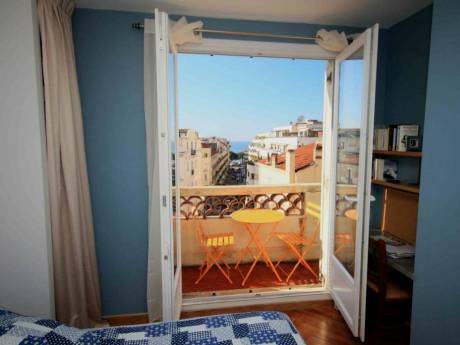 Last floor with balcony in front and very close to beach at Cannes (La Bocca). There is an airport just behind our appartment but only for private jets and helicopters, but you can take flying lessons or practice your existing licence in private flying clubs! We are family composed of six members, 4 boys included from 14 to 24 years old. My name is Fabienne Gualco and I usually take my holidays alone with the kids, mostly now, with the last two. ) who need to learn English I have a lot of experience in travelling, since my father was often tranfered to different countries due to his work, all through my youth. I speak French, English, Italian, Portuguese and a bit of Spanish. So no problem for communicating! We started home exchanging 2 years ago and found it to be a very pleasant experience! So now, we do it as often as possible. I try to exchange with Anglo-Saxon countries as my children have the necessity of getting better with their English. NB we are very interested this year in an exchange end april/may with toronto and new york perhaps even Montreal. (from 20th of april to 7th may2012 all three locations included, I'll have a friend who will come with us this time, so we will be a total of 4. NB(urgent!) if you do not have the possibility of coming during this period, would you consider hospitality for that period, for just the 2 intermediate boys, very good boys,and will settle for a double convertable sofa. 18 and almost 15years old, 1 is in university and the other is in highschool (lycée) (to get on with their own english,) and then, as our home is a second home, you can come at any other period you may like. NB We are very interested this year in a long exchange with a house or appartment in london from the 1st of july to the end of august 2011. Cannes la Bocca about 5 km from centre of Cannes along the promenade. There are many beautiful places to see on the Côte D'azur, beginning already with the two Islands, (that can be seen from the appartment just in front) Sainte Marguerite (prison of the "masque de fer"), and Saint Honorat where there is a big monastery. 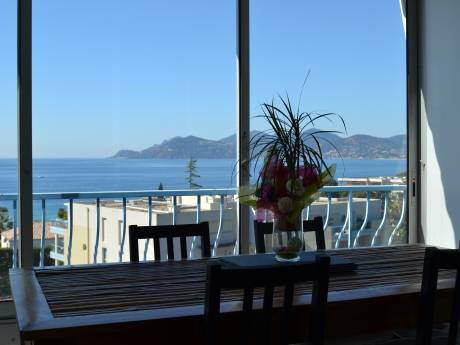 We are close to everything, sea and mountain and "la Provence" be sure to look up things you want to see before coming because there are soo many beautiful things to see!!! Nb We are about 60km from the Italian Fontier (Vintimille, or Ventimiglia in Italian), but Bordighiera next to Vintimille is already much better and then you have the rest of the Italien Riviera which is very beautiful.